What is your goal with this blog? 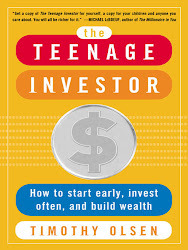 The goal of my blog is to encourage Generation Y investors (i.e. millennials as we are often called) to invest both early and often. Most readers are embarking on brand new careers, and are now in control of true discretionary income for the first time. My goal is to help you understand the best ways to invest that money while avoiding the Wall Street hype machine's tentacles, all the while staying disciplined in the process. While I will not recommend any specific investments, I will offer comments and opinion on how the current news of the day in the financial world and beyond may relate to Generation Y investors and their finances. Also, I will occasionally post and comment on articles that may interest millennial readers and highlight certain strategies that have worked for us. Please don't get the impression that this blog is purely about investing! Instead, I will also talk about Gen Y careers and professional life, money management, and anything else I think the financially conscious millennial reader will enjoy. As a fellow member of Generation Y, I know exactly what you are going through. I have been investing for greater than half of my life and had an investment guide for teenagers published in 2003 by McGraw-Hill. I earned by B.S. in Finance from Louisiana State University in 2011, earned an MBA from Loyola University New Orleans in 2015 and have been working in a supply chain role for a major corporation the past four and a half years. While in high school and college, I interned at financial firms such as a hedge fund and a local investment management firm. Most importantly, however, I practice what I preach! I invest the same way I recommend that you invest. By sticking to a disciplined investment plan of index funds, I was able to weather the Great Recession and have done much better than if I would have tried to guess which individual stocks would pull through. Please note that nothing on here is part of a "get rich quick" scheme and I certainly am not telling you exactly how to invest. Instead, I talk about the strategies that have made countless investors wealthy such as indexing, dollar cost averaging, and taking advantage of the tax benefits of Roth IRAs (among many other things)! Interestingly, many people don't understand what Generation Y is, let alone even know if they are a part of it! Most people are familiar with the terms Generation X and Baby Boomer which are used to describe different generations. Generation Y is a demographic that encompasses those people born between the mid-1970s and early 2000s and it remains a demographic that has long been underserved when it comes to financial advice. Worse still, that ignorance on the part of Wall Street and the financial community is stunning because of the sheer amount of assets and spending power millennial's control. In 2015, research by Youbrand concluded that Gen Y's had combined spending power of $2.45 trillion globally. Imagine what would happen to the long-term financial success of millennials if even only a small fraction of that money was invested. My goal is to help the novice millennial investor navigate the financial markets so that they can be a part of what I like to call "Generation WI$E" - the informed investors who make up our demographic! Do you recommend individual stocks? No. I don't recommend individual stocks for a few reasons but namely because I think that index funds offer a more cost-effective and efficient way to wealth than picking individual stocks. Secondly, I know very little about the personal financial situation of each reader so that it would be pointless for me to recommend individual equities. Lastly, each investor invests with different goals and risk tolerances in mind. Most of the time stock picking is futile given the high costs associated with it, and the desire most investors have to abandon a long-term view by trying to time the market. The only individual stock I own is PepsiCo (PEP) which is the first stock I ever purchased as an 8 year old.